Social Skills are imperative during the adolescent years due to increased contact with peers and as training for adulthood. Some adolescents need extra assistance and practice of these important life skills. Social Skills for adolescent boys 11 to 14 will focus on the following areas; dealing with feelings, communication, teamwork, decision-making, goal-setting, self-control, making and keeping friends, and self-esteem. During this weeklong group, adolescents will learn about, discuss, and practice these skills while interacting with their peers. Adolescents will also provide their peers with therapeutic feedback on their participation while earning rewards for prosocial behavior. Facilitated by Katie Overcash, LCSW and Lynne Beck, LPC who have over 20 combined years experience in the mental health field in various setting such as school, residential, and outpatient. Both licensed therapists have years experience running these groups and currently own outpatient mental health businesses, Overcash Therapy Services, PLLC and New Journey Counseling respectively. Participation in the group includes 15 hours of direct contact with both licensed therapists and a parental consultation at the conclusion of the week with either Katie or Lynne. Space is limited for more individual attention, so register now! Cost of the group is $300 with one partial scholarship available. Download the flyer below if needed. Please fill out this FORM for initial registration. 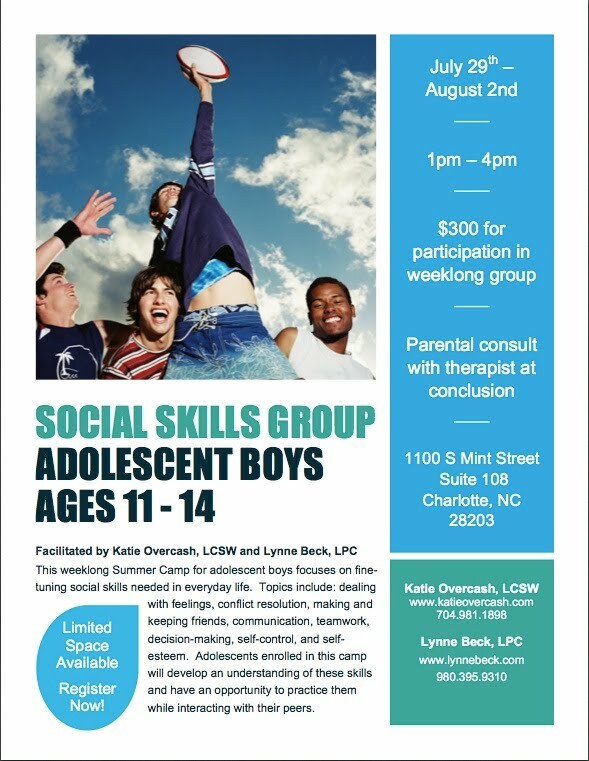 Social Skills Group for Adolescent Boys 11 – 14 will be held Monday, July 29th through Friday, August 2nd from 1pm to 4pm at 1100 South Mint Street, Suite 108, Charlotte, NC 28203. Feel free to contact Katie Overcash (katie@katieovercash.com or 704.981.1898) or Lynne Beck (lynne.beck@live.com or 980.395.9310) for more information or questions. This entry was posted in Uncategorized and tagged adolescents, boys, Charlotte North Carolina, communication, life skills, making friends, Mental health, Peer group, recognizing feelings, self-esteem, Social skills, teens on March 6, 2013 by katieovercash.